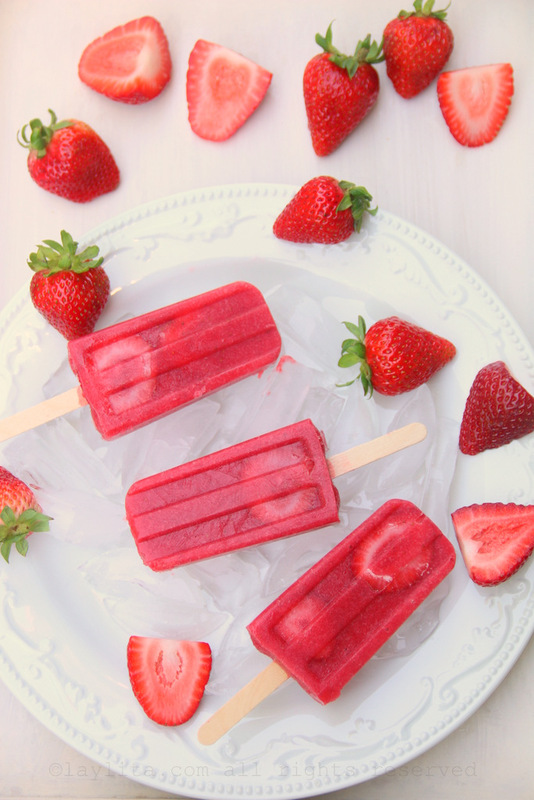 This is my super easy recipe for homemade strawberry popsicles, made with only pure fresh strawberries (no sugar or water added). The weather in the Seattle area has been amazingly warm and sunny this month. It’s so ironic that my Texas born kids are not used to it and consider 70F-80F degree weather to be a heat wave. My youngest son asked me to buy him an air conditioned shirt to survive. 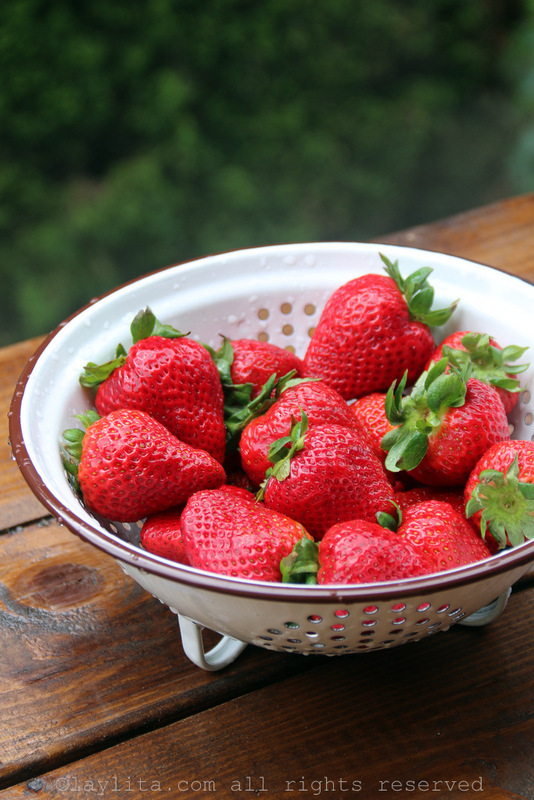 The first thing they do when they get home from school or activities on these warm days is to go directly to the fridge and ask if I have any cold and refreshing snacks. 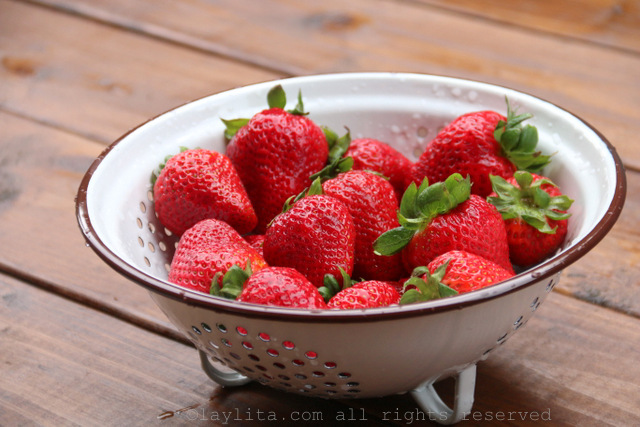 Easy and simple recipe for homemade strawberry popsicles, made with pure fresh strawberries, no sugar added. 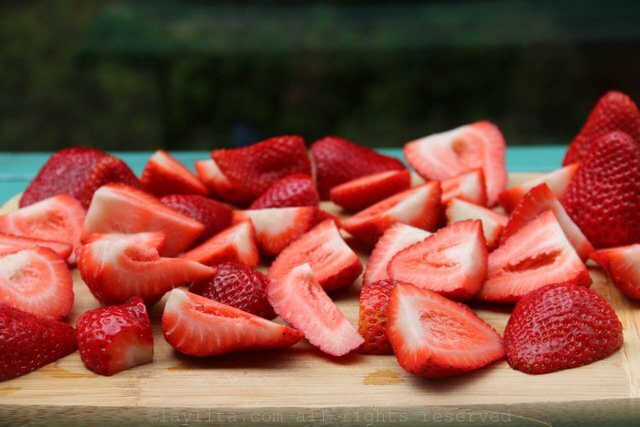 Cut about 5-6 of the strawberries into thin slices and reserve to decorate the molds. 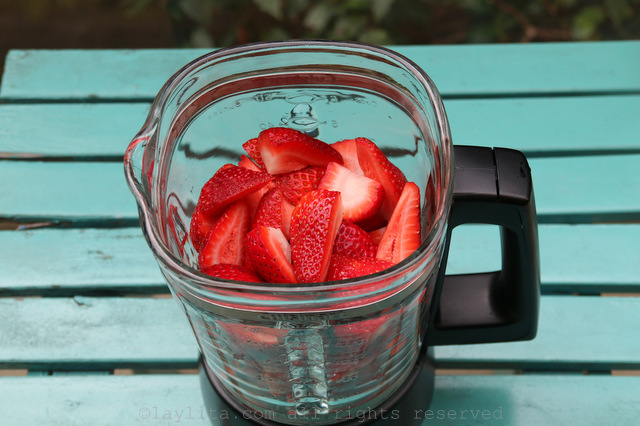 Cut the rest of the strawberries into halves or quarters and blend them until you have a puree. 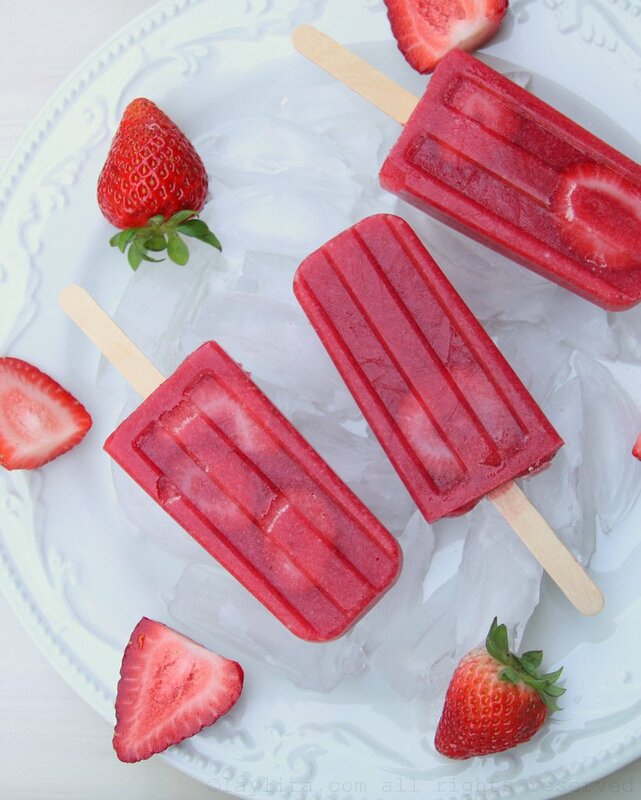 Place the sliced strawberries in the popsicle molds, try to stick them to the edges, this will give the strawberries popsicles a fun fruity look. 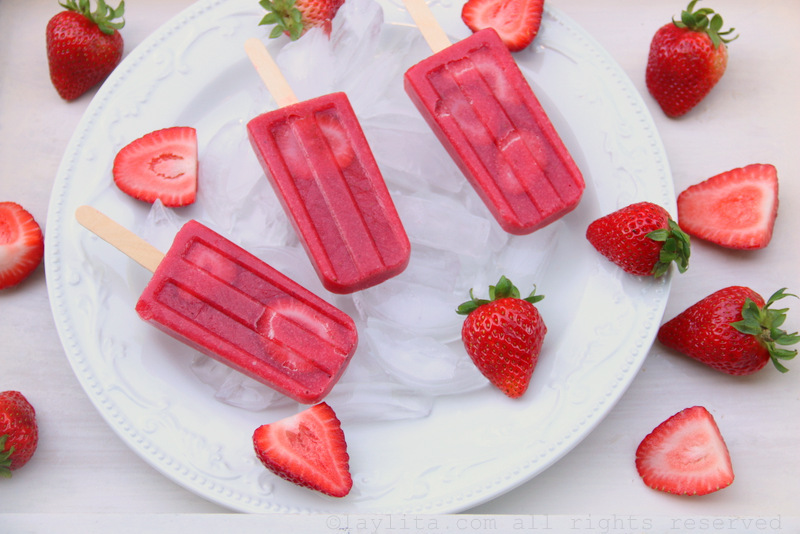 Pour the strawberry puree into the popsicles molds, cover and insert the popsicles sticks. 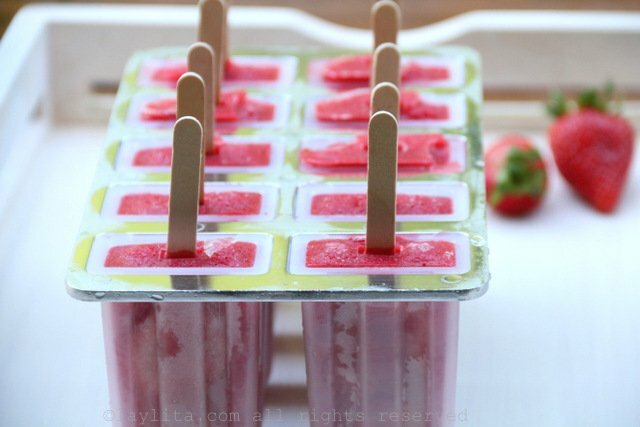 If you are using small cups as popsicle molds you can cover them with foil and insert the popsicle stick thru the foil to keep them in place. Or let them freeze for about an hour and then add the sticks. 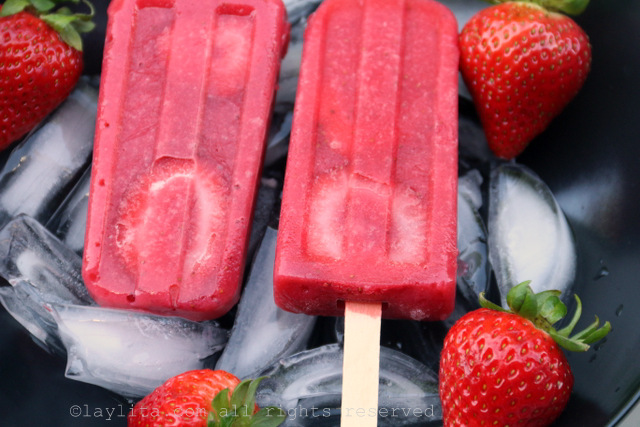 Place the popsicles in the freezer for about 3-4 hours or until fully frozen. To make it easier to remove them you can dip the bottom of the mold in lukewarm water for about 10-20 seconds. They both love strawberries, so I thought that homemade strawberry popsicles would probably meet the demands of cold and refreshing. 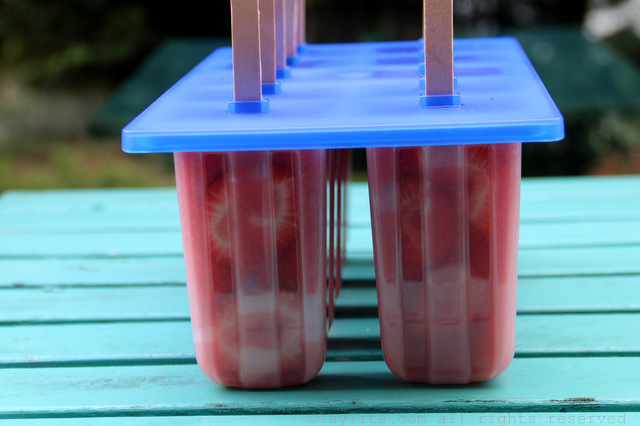 I wanted to keep the popsicles as close as possible to the fresh strawberries that they love. 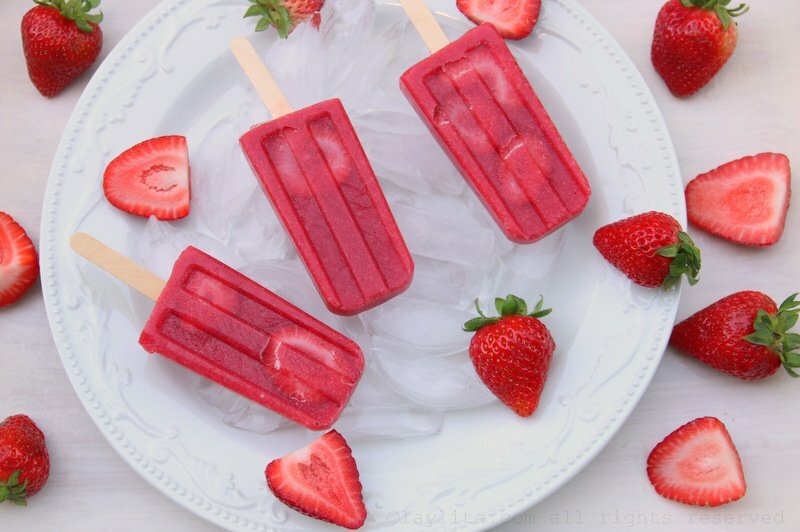 Since I don’t usually add water or sugar when I give them a bowl of fresh strawberries, I figured I wasn’t going to do so for the popsicles and kept them completely pure. 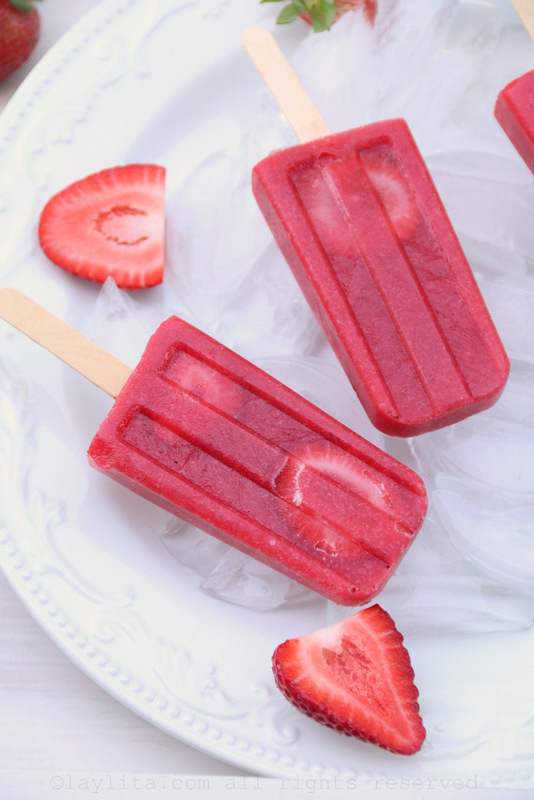 I’ll admit that I was a little bit concerned that the kids would complain that these sugarless strawberry popsicles were less sweet than the usual store bought ones, especially since freezing fruit can make it seem less sweet. 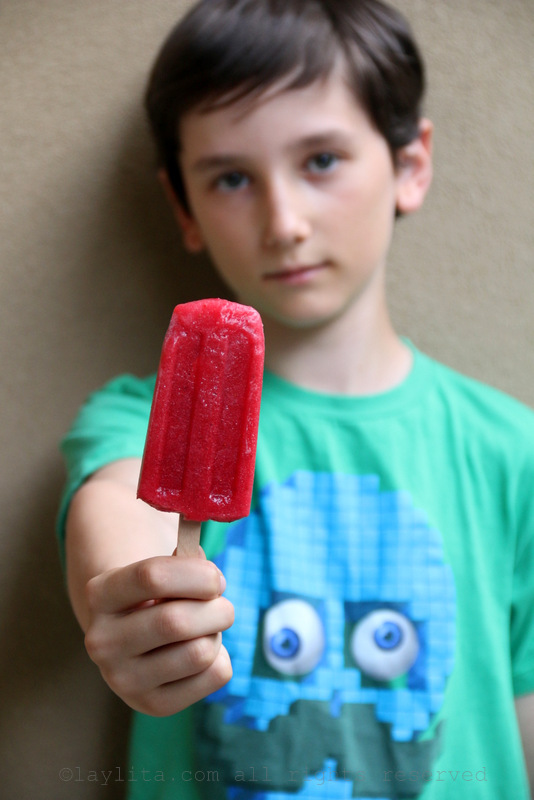 I decided it would be better to tell them upfront that these popsicles didn’t have any sugar or honey in them. They were a little bit skeptical, like most kids they love overly sweet stuff, but they were also hungry and feeling the “heat wave”, so they gave them a try and ended up loving them. 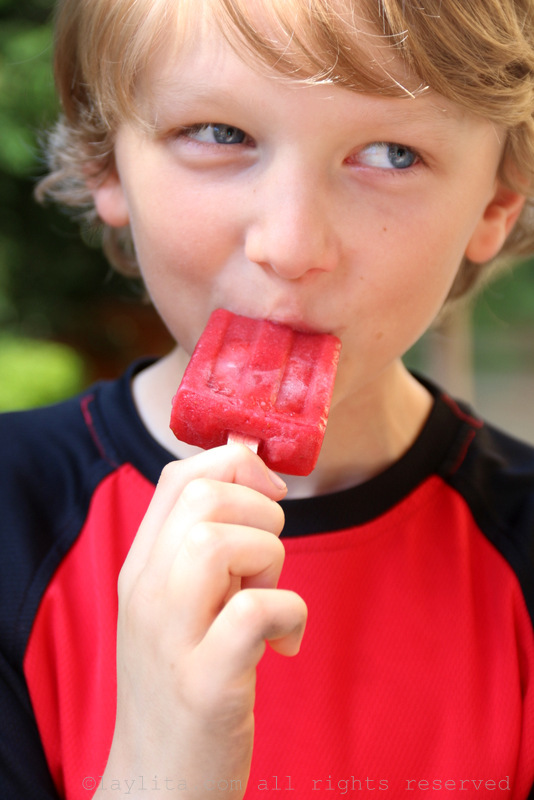 I also love them and like that I can enjoy a guilt free good for you popsicle on these warm days. 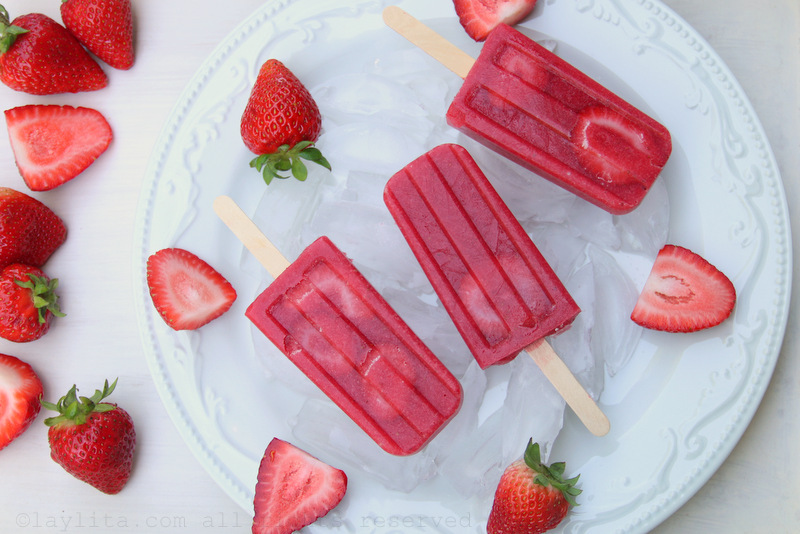 These strawberry popsicles are so easy and simple that I almost feel embarrassed calling it a recipe and posting it, but since I took the photos I might as well share it (and next week, I will share a post on how to boil water –ok, just kidding). 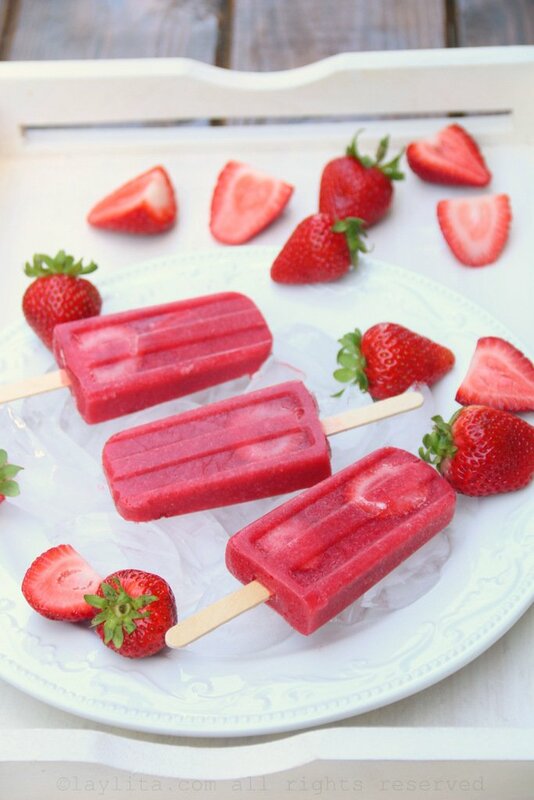 Perfect strawberry popsicles! My grandson has EoE and many food allergies and is on a very strict diet. These were great for his 2nd birthday party. Where did you get those popsicle molds from? It’s difficult to find one that will actually stand up in the freezer. Plus, that one looks like it makes a lot at more once compared to 4 or 6. Love the simplicity of this. 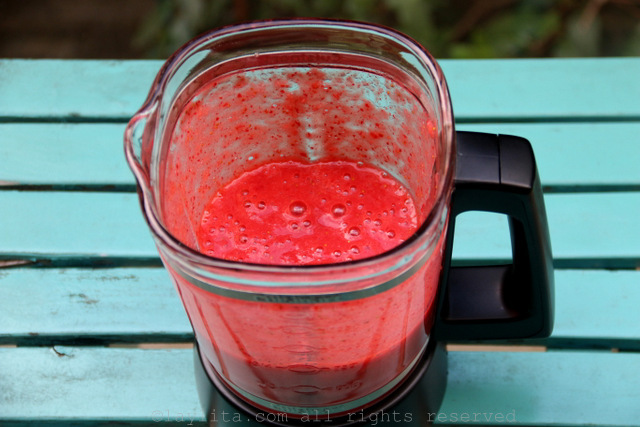 I try to stay away from sugar, and this looks like a perfect treat for my 4 kids! I started Chemo yesterday and was looking for a sugarless recipe for popsiciles and I believe I found a great one. Thanks for sharing. A devine recipe! I have the exact same molds!! Got it at Kitchen Kapers!